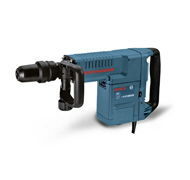 Light weight demolition hammer with variable speed for a wide range of concrete chipping or digging tasks. Uses 3/4" Hex Steel with round end steel points, chisels or bush heads. Also can be used with a clay spade for digging in hardened soil. * Please call us for any questions on our hammer demo 20lb rentals in Portland OR, Gresham OR, Milwaukee OR, and surrounding metro area.